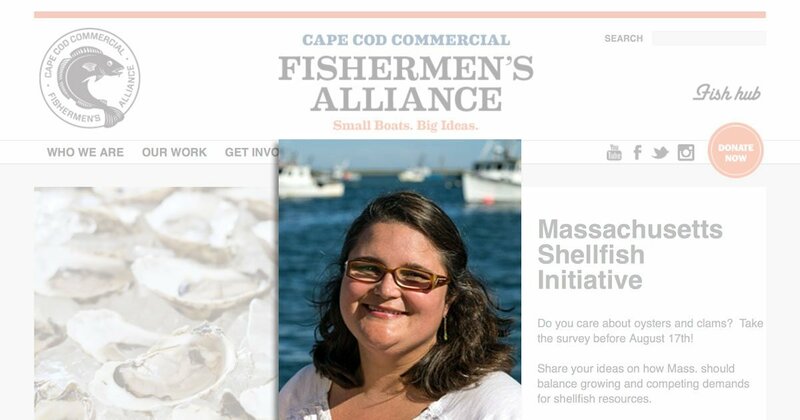 Our featured speaker for the August, 2017 BARS meeting will be Melissa Sanderson, Chief Operating Officer of the Cape Cod Commercial Fishermen’s Alliance. Melissa will be speaking about the Massachusetts Shellfish Initiative. Sean McNally, a UMass Boston PhD student working on the Massachusetts Shellfish Initiative with Melissa, will also be at the meeting. Melissa Sanderson previously lead CCCFA’s efforts to develop, test and implement technical solutions for monitoring and managing Sectors in New England before becoming Chief Operating Officer. Mel came onboard in 2004, serving as Fishermen’s Alliance Cooperative Research Coordinator and later as Development Director. Mel grew up in Minnesota, but earned her sea legs studying marine biology on the West Coast, where she received her BA in Marine Biology from Occidental College. She interned with the Fishermen’s Alliance while obtaining her Masters in Coastal Environmental Management from Duke University. She was awarded the 40 Under 40 Award from Cape & Plymouth Business in 2013 and served on the Cape Cod Young Professionals Board of Directors (2009-2014). Share your opinions about shellfish! The Massachusetts Shellfish Initiative is asking for your voice to be heard. Please take the anonymous survey before August 18th! The survey and more information can be found online at www.massshellfishinitiative.org, or go straight to the survey at: tinyurl.com/MSIsurvey2017. If you would like a paper version of the survey, please contact Mel at 508-945-2432 x103. The survey, conducted by UMass Boston students, is meant to guide the development of recommendations for the Mass. Shellfish Initiative. It is important that ALL voices are given the opportunity to be heard during this initial scoping phase. The Mass Shellfish Initiative is intended to be collaborative process that improves communication among shellfish harvesters (wild, aquaculture, tribal and recreational), state and town agencies, non-profits and environmental organizations, scientific and research organizations, and the general public. It will be a tool to responsibly expand shellfish resources in Massachusetts, with the goal of maximizing the economic, environmental, and social benefits of shellfish. The meeting will be August 1 at 7:00 PM at the West Barnstable Community Building, 2401 Meetinghouse Way, West Barnstable, MA. We look forward to seeing you there. Please bring your questions and a guest. Our meetings are always open to the public. We will also have BARS hats, t-shirts, and polo shirts with the new BARS-Cape Cod logo available for sale.